Sarah Millis is a Grand Prix dressage rider and trainer; she has represented Great Britain at ten European Championships and many senior international events. If a horse is working on his forehand, he will not be engaging his hind quarters correctly. He will be pulling himself forward from his shoulders, rather than propelling himself from behind with a light, athletic front end. He will be heavy in your hand, and will want to lean on you for support; effectively you will be carrying him, rather than him supporting himself. This situation is often described as working ‘downhill’, rather than with the desired ‘uphill’ movement we like to see in correct flatwork. 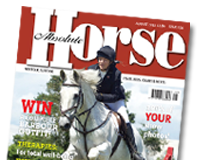 In this issue Sarah provides tips and exercises for improvement.